Coastal strawberry photographed by (clockwise from top left): Georgia Brander, Kate Adams, Brian Starzomski, Ian Cruickshank (post-flowering, growing on a rocky bluff), and Sara Wickham (berry). 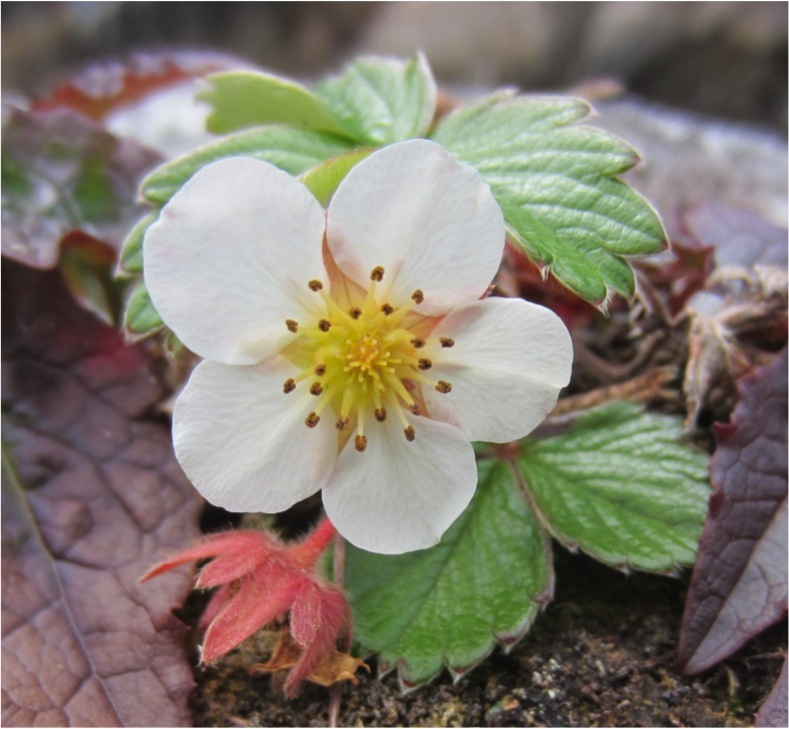 Coastal strawberry is a flowering perennial that produces edible fruits. It is usually low-lying, though it can grow up to 25 cm tall. It has reddish, hairy, leafless trailing stems that root at nodes, forming runners between rooted flower-bearing shoots. 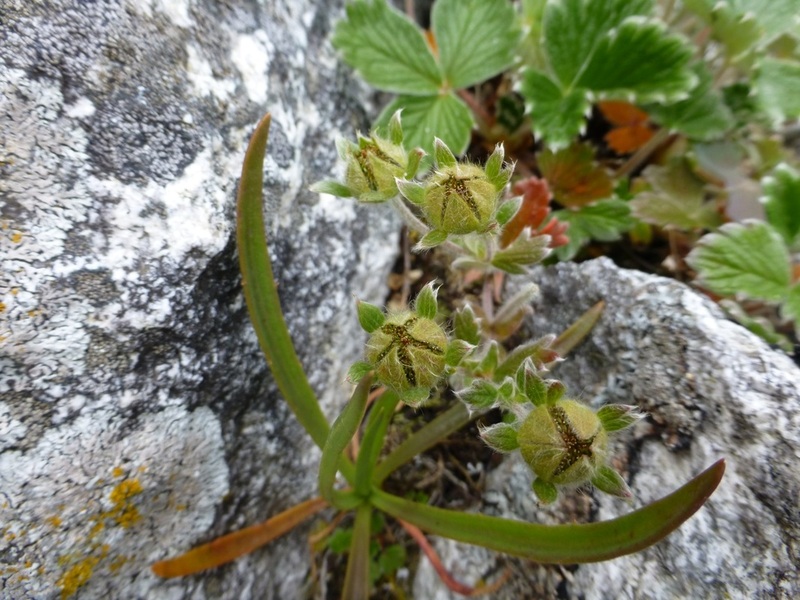 The leaves form rosettes around the base of these flower shoots, though with leaf stalks up to 20 cm long this rosette structure may not be obvious. The leaves are thick and leathery, and are composed of of three toothed leaflets. The flowers are white, five-petalled, and cluster in groups of 5-15. The plant produces small, hairy strawberries in the spring and summer, which are only about the size of a fingernail. 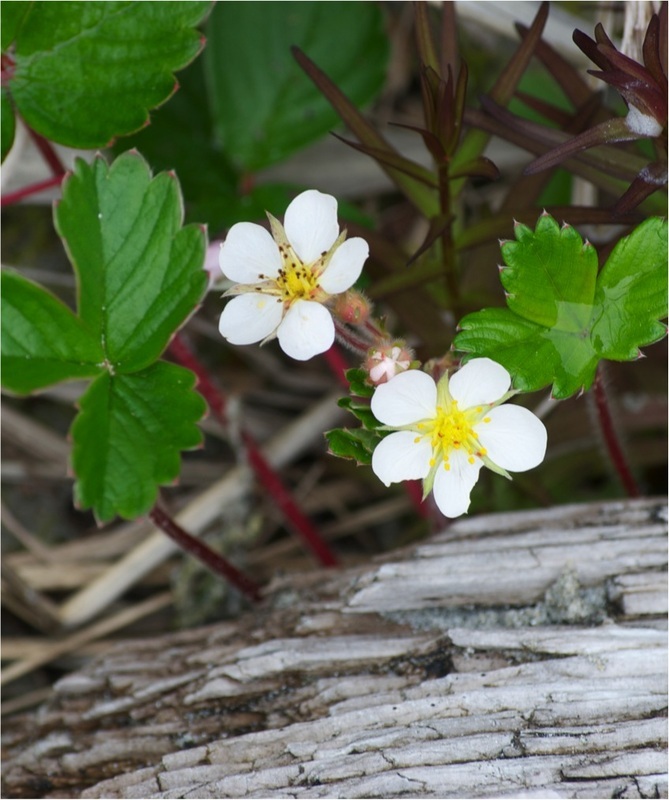 Coastal strawberry is, as its name suggests, restricted to areas close to the ocean such as rocky bluffs and sand dunes. It is a common coastal species from Alaska south to California, and in South America. It is also found on the Hawaiian Islands. 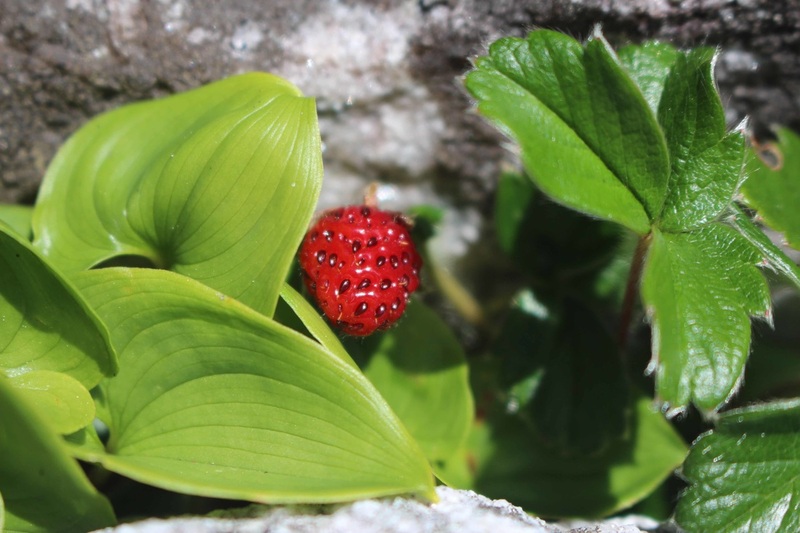 There are other wild strawberry species that are similar to the coastal strawberry, but they are found in many habitats and have thinner leaves. Villous cinequefoil (Potentilla villosa), another member of the Rosaceae (Rose Family), has similar leaves to coastal strawberry. Distinguishing features of villous cinquefoil, when not in flower, are the white, woolly leaf undersides, the lack of creeping runners, and the lack of reddish stems. There are also a number of subspecies of F. chiloensis, as seen here, and discussed in more detail in this article. This fruit was eaten by many Indigenous Peoples in its native regions. Because they are so juicy, they were generally eaten fresh, not dried or otherwise preserved. The commercially cultivated strawberry known to many of us today is Fragaria ananassa, which is a cross between F. chiloensis and F. virginiana. These species were first hybridized in France in the 1700s, after a French spy brought home some of the plants he found in Chile. Much more on the history of the strawberry can be found in this online republication of the book The Strawberry: History, Breeding, and Physiology. Darrow, G.M. (1999). The Strawberry: History, Breeding, and Physiology. New England Institute for Medical Research. Accessed 30/03/2013. Catling, P. M., and Porebski, S. (1998). 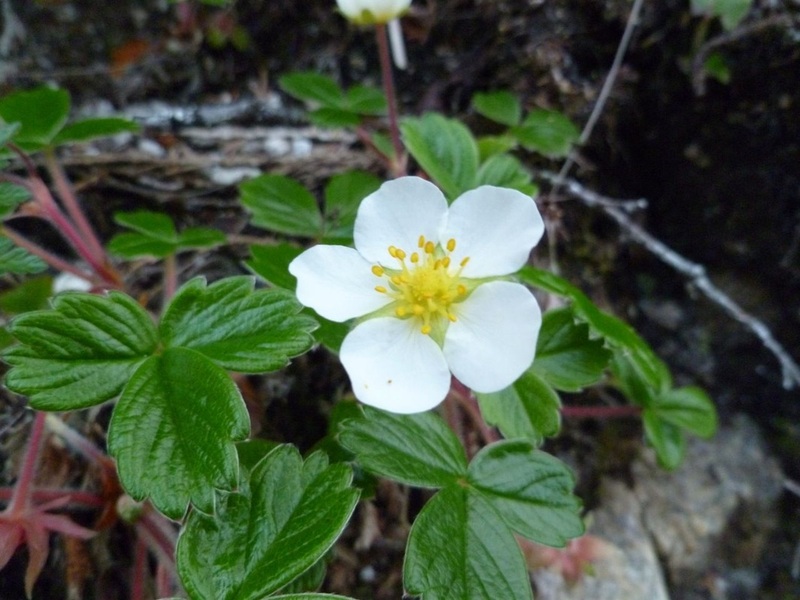 A morphometric evaluation of the subspecies of Fragaria chiloensis. Canadian Journal of Botany, 76, pp. 290-297. Pojar, J. and MacKinnon, A. (2005). Plants of Coastal British Columbia, Revised. Vancouver, BC: Lone Pine Publishing. P. 183.